Community is one of Craig Gaulden Davis’ highest-held values. They believe that design is so much more than just planning an addition to a building—it has the power to transform people and the places around them. The firm wanted to unite and engage the design community, their current clients, and potential clients. Craig Gaulden Davis (CGD) Architects enlisted Engenius’ help in 2016 to improve their website and digital communication efforts with their target audiences. At the time, the firm had been around for nearly 60 years and their website did not effectively demonstrate its team’s many years of expertise, culture, and skill. 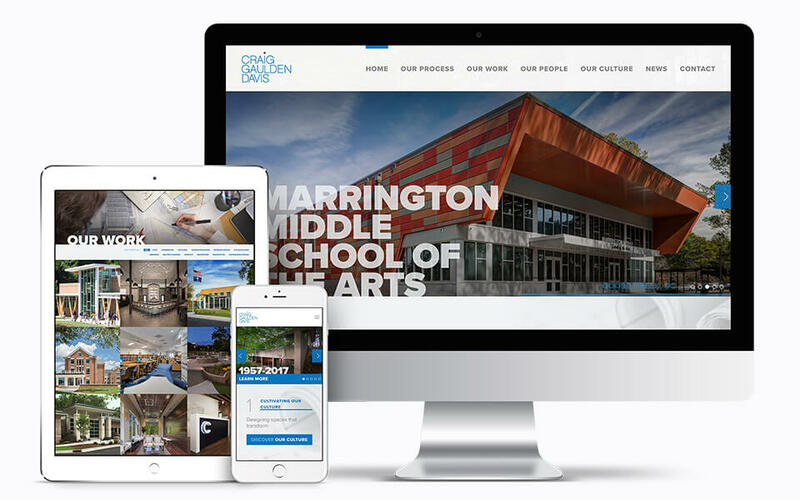 CGD’s main concern was that the website’s project portfolio was severely lacking—both aesthetically and technically. In addition, the firm didn’t have a streamlined and effective way to communicate with clients on a regular basis. Increase prospective clients’ interest and trust in Craig Gaulden Davis by demonstrating the firm’s experience and culture. Since so many of CGD’s clients are repeat clients, it was also important for the firm to maintain regular communication with their client base and highlight recent happenings. According to CGD, the element that matters most to their target audience is past experience. Therefore, it was critical to develop a stunning project portfolio that demonstrates CGD’s past work. The finished product features dozens of CGD’s projects and is filterable by industry, so users can find exactly what they’re looking for. Calls-to-action can be seen across the website that direct users to the portfolio page or specific portfolio items. From a design perspective, we aimed to draw parallels between the quality and uniqueness of CGD’s projects and their website. We incorporated custom typographic elements on various pages and carried movement across the site via animated features. The site represents CGD as forward-thinking, distinctive in their industry, and technically advanced. 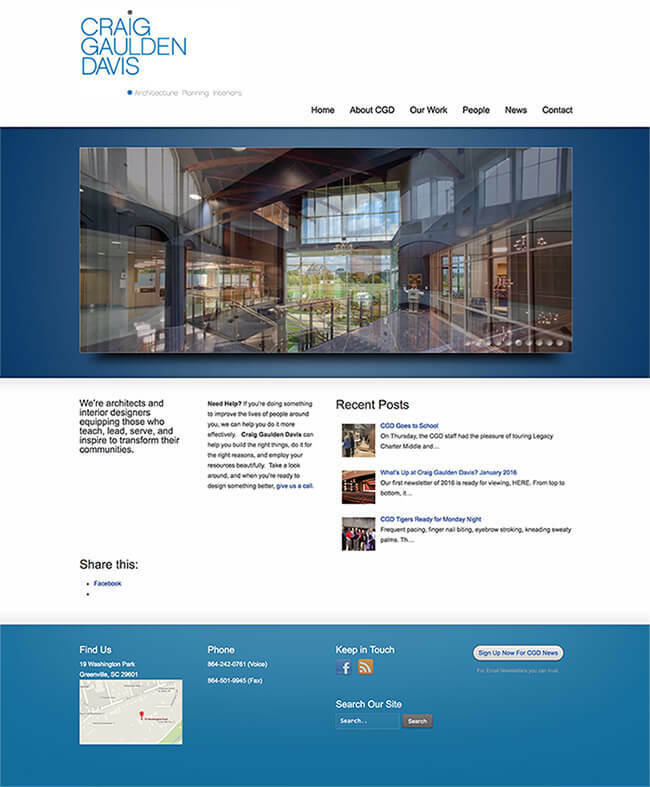 In addition to the portfolio, the site places emphasis on the firm’s culture. The first few calls-to-action on the homepage point users to the “Culture” and “Meet Our Team” pages because the firm’s history, values, and commitment to their team members set CGD apart from their competitors. We also maintain a monthly email newsletter for CGD, which allows them to communicate with their clients more consistently. The newsletter sends users to the “News” page on CGD’s website which features recent work and company milestones. A few months after CGD’s website launched, we launched an ongoing SEO campaign. Our goal was to increase exposure among prospective clients by appearing higher in search engine results for search terms that are relevant to CGD’s services. To start, we spent time doing more advanced keyword research and incorporated those keywords on the site. We created a scannable hierarchy of information on the appropriate pages and added meta descriptions to further improve SEO. When search engines return results, they scan websites for the keyword that are most relevant to the user’s search query. The more optimized a website is for search engines, the higher it will appear in search results for appropriate queries. Since beginning SEO services, CGD’s average search engine result position for some highly competitive primary keywords has begun to improve. In addition to improved rankings for certain keywords, many of CGD’s website metrics are significantly better than other architecture firms of a similar size in South Carolina. CGD’s email newsletter showcases completed projects and cultural happenings at the firm. Since beginning email marketing with Engenius in March of 2017, CGD has seen an average open rate above the industry average for architecture and construction. People are also engaging with CGD’s content—their click rates from emails are consistently above the industry average of 2.9%.